On Wednesday, SVG hosted nearly 300 people from across the Los Angeles production community for three concurrent events: LiveTV:LA, Sports Imaging Forum, and Facebook Video Boot Camp. The highlight of the day, undoubtedly, was a highly entertaining keynote conversation with legendary producer David Hill, who expounded on everything from millennial viewers to the inspiration he has drawn from both videogames and his Toyota Sienna minivan to his overall view of the television industry (it’s healthy). 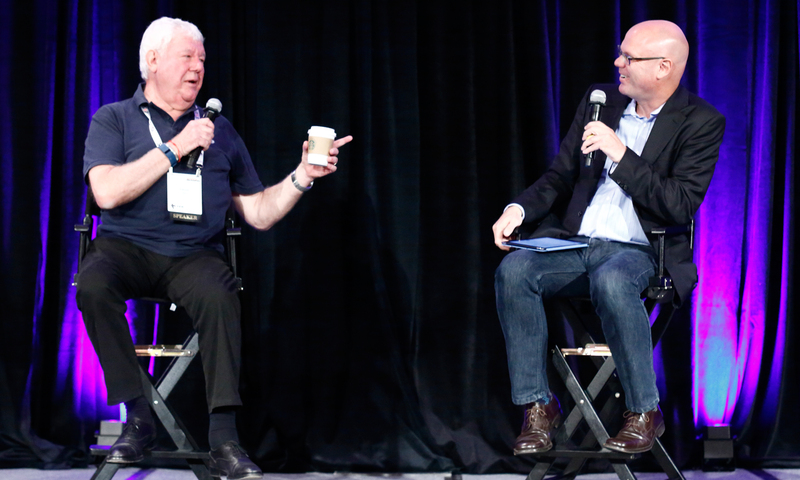 SVG’s Ken Kerschbaumer (right) led the keynote conversation with Sports Broadcasting Hall of Famer David Hill. Throughout the conversation, the often irreverent but always brilliant Hill elaborated on the inspiration he has drawn from his own life: most notably, his family. Watching his children engage with videogames and interact with their mobile devices, he sought to create television that, more than simply entertaining, actively engaged the viewer through graphics. And, in one of his more comical tangents, Hill described how the experience of buying a Toyota Sienna minivan influenced his decision to rethink the traditional methods of producing NFL football. With a career that has spanned three continents, Hill launched both Sky Sports and Fox Sports; served as executive producer for the Academy Awards, the Super Bowl, and American Idol; and is currently — through his production company, Hilly Inc. — co-promoting professional darts alongside Barry Hearn’s Professional Darts Corp. (PDC). In closing, he recalled a panel discussion he took part in at the University of Colorado where his fellow panelists predicted the imminent death of network television. Hill had the perfect response.